Purchased pesto is one of the best convenience foods on the market, and pesto from scratch is simple to prepare and even more delicious. Traditional pesto is made of fresh basil leaves, olive oil, Parmesan cheese, garlic, and pine nuts, but there are plenty of other recipes including alternative herbs and nuts such as chives and walnuts. Although it is most commonly used to top cooked pasta, pesto can be so much more than a pasta sauce. There are so many tasty ways to dress up a recipe with pesto, whether store-bought or homemade, that you may want to prepare (or buy) a double batch. If you buy pesto pre-made from the store, or your homemade has been sitting in the fridge, be sure to stir it before you use it in recipes. As it sits, the oil can separate from the rest of the mixture. Pesto is delicious incorporated into many different types of appetizer recipes. It can simply be spread onto crostini and topped with a grape tomato half or a shaving of Parmesan cheese. 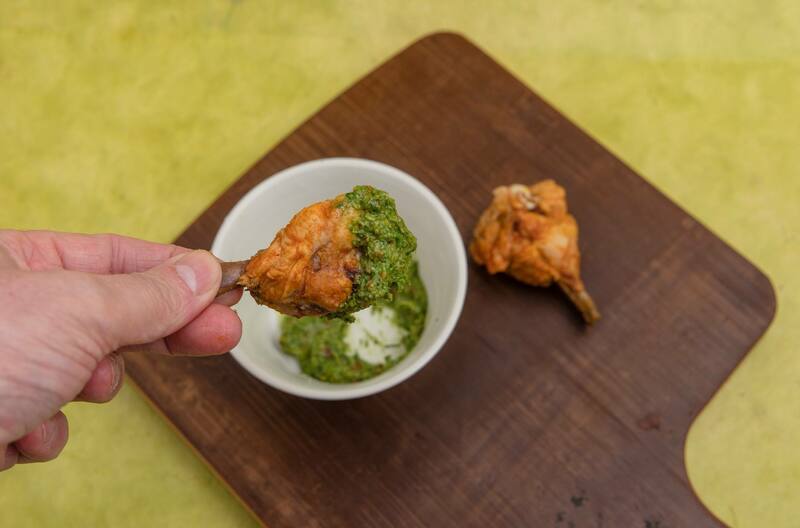 Or use pesto as a sauce for shrimp cocktail or practically any hors d'oeuvre that is accompanied by a flavorful dip. And if you'd like to use the pesto as a dip itself for vegetables and chips, first mix it with a bit of Greek yogurt, sour cream, or cream cheese. A baked brie is delicious topped with a bit of pesto, and you can turn pesto into an impressive party dish such as a pesto torte; the herb and nut mixture is layered between cream cheese and sun-dried tomatoes, creating a festive molded spread perfect for any holiday or gathering. Pesto, although substantial to stand on its own, can be successfully combined with other ingredients to either enhance the flavors of a dish or make a standout salad dressing. Pesto mixed with olive oil or mayonnaise makes a regular salad special and is the perfect dressing for tuna, chicken, and pasta salads. It can also add tremendous flavor when mixed into rice, risotto, or mashed potatoes, or dolloped onto hot vegetables such as cauliflower to transform fair into fabulous. Give your ​meatball mixture a flavorful twist with the addition of pesto and your family will be begging for more. Tired of mayonnaise and mustard? Spreading a bit of pesto onto the bread before layering the fillings will bring extra flavor and a bit of excitement to any old standard sandwich. Pesto is perfect in a tomato-mozzarella panini, but equally delicious on a typical turkey sandwich or inside a chicken wrap. It's particularly good in open-faced sandwiches as well. Of course, pesto is a sauce for pasta, but it is also super as a sauce for meat, fish, chicken, and vegetables. Spread pesto onto grilled salmon or balsamic chicken, or thin it out a bit with some olive oil so you can spoon it on top. Add some zest to a simply grilled steak by serving with a side of pesto sauce, and everyone at your cookout—not just the vegetarians—will be reaching for the veggie kababs when they are drizzled with a bit of pesto. A pesto sauce will also breathe new life into baked tofu. And grilled Chilean sea bass is a simple but elegant recipe that cleverly places a spoonful of pesto underneath the fish, adding delicious flavor with every bite. A dollop of pesto as is will also be an unexpected but welcome garnish to soups, such as a wild rice chowder or tomato bisque. 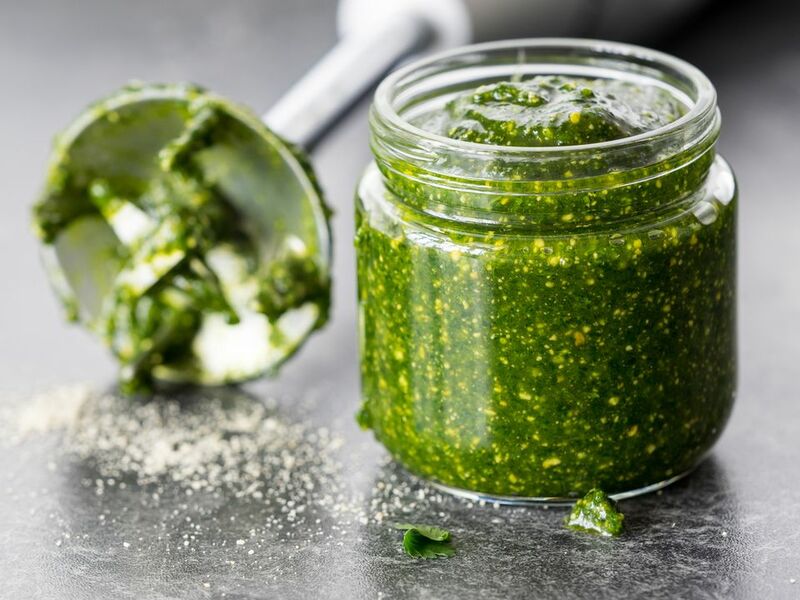 Whether on its own or mixed with other ingredients like cream cheese or bread crumbs, pesto makes an excellent ingredient for stuffing into sandwiches and baked breaded chicken. (Combining with sour cream or mayonnaise helps insulate the delicate ingredients from the heat and adds wonderful texture.) It is an excellent addition to a grilled cheese sandwich and takes boneless chicken to a whole new level when stuffed inside before breading and baking (cut a slit in the chicken creating a pocket and fill with pesto before breading). It is also delicious used in place of the egg when oven-frying chicken, creating a moist and flavorful layer to an often ho-hum dish. Often considered "pizza for adults," a pizza topped with pesto instead of red sauce is a nice change from the traditional pie. It opens the door to so many different types of toppings such as grilled chicken or shrimp, or a vegetarian pizza with artichoke hearts and kalamata olives. Wonderful as a dinner with a side salad, pesto pizza is also ideal cut up and served as an hors-d'oeuvre. If you are someone who enjoys a sauce on the side with your eggs (whether it be ketchup, hot sauce, or even jelly), cooked eggs with a little bit of pesto is a whole new ballgame. Whether scrambled, poached, or fried, a spoonful of pesto alongside some eggs is a delicious way to start the day—especially if there are some home fries on the plate. Or treat yourself to a different kind of grilled egg and cheese sandwich with pesto. Pasta is a natural partner for pesto. As you toss hot cooked pasta with the pesto, the heat brings out the fabulous flavors of the basil, garlic, and cheese. But that doesn't mean you should only serve pesto tossed with plain noodles (although that is certainly delicious); there are so many other ways to incorporate pesto into your pasta dishes. Pesto salmon pasta features a creamy pesto sauce by combining the herb mixture with cream and sour cream, complementing the grilled salmon beautifully. Instead of a traditional lasagna, vegetarian lasagna rolls are filled with pesto, sweet potato, and cheese, making a hearty and flavorful main dish for vegetarians as well as meat-eaters. And if you've never thought of combining avocado with pesto, you've been missing out. Avocado and pesto pasta is a healthy and colorful dish that you'll be craving from here on out. Pasta Sauce, Gravy or Ragu'? Understanding Italian Wine Labels: What Are DOC, DOCG, IGT and VdT? What Does DOC or DOCG Mean on an Italian Wine Label?